SACHSE, Texas, Dec 13, 2016 (SEND2PRESS NEWSWIRE) — Top industry expert and professional makeup artist Rosalyn Bellamy, CEO and founder of Ros B Beauty, launched Ros B Beauty Luxury Cosmetics at a December 8 gala launch party at Salon M in Frisco, Texas. The cosmetic line, offering high performance products catering to all skin tones and types, includes Camera Ready Primer, HD Pro Finish Foundation, Dual Powder Pro Finish Foundation, Pro Finish Liquid Concealer, Blush On, Luxe Lip Gloss, and Liquid Velvet Lipstick. Eager to experience what the in-demand, highly respected make-up artist would be introducing, fans gathered outside Salon M waiting for the doors to open at last week’s hugely successful launch party. Ros B demonstrated holiday glam makeup tips and offered make-overs to enthusiastic guests who were thrilled with the products as well as their new holiday looks. Frustrated by the lack of flattering shades for diverse skin tones, Ros B set out to introduce her own line of luxury cosmetics. The Ros B Beauty Luxury Cosmetics line is strongly influenced by her determination to offer quality products in deeply pigmented colors that provide great coverage and staying power, especially for makeup lovers with medium to dark skin tones. “Each product in my line has been formulated with the highest quality ingredients to ensure that colors are bold, and provide coverage that doesn’t disappear in a few hours, creating a flawless, healthy soft-focused radiance. My products allow your complexion to catch light for a glowing, lit-from-within look,” said Ros B.
Ros B developed and honed her makeup artistry skills working under the most talented professionals in the industry, constantly improving her techniques. Her warm, personal touch, combined with her mastery of highly unique techniques, has gained Ros a huge reputation and loyal following as a most respected, loved and in-demand professional makeup artist. “My goal for Ros B Beauty Cosmetics is to empower others to express their own kind of beautiful, and to make it easy and fun for them to look gorgeous and confident,” shares Ros B. For nearly 20 years Ros B has been fulfilling her passion for transforming faces, using makeup as a tool for empowering women inside and out. Beyond her extreme talents in creating classic, yet distinguished looks, Ros loves educating women in makeup artistry and how to duplicate her techniques. 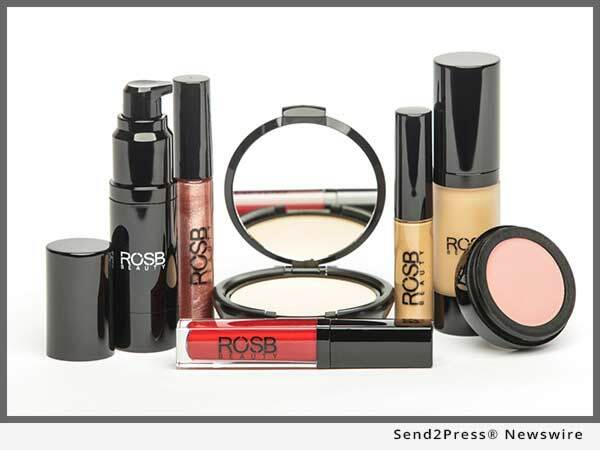 To purchase or learn more about the new Ros B Beauty Luxury Cosmetic line, visit http://www.rosbbeauty.com/.